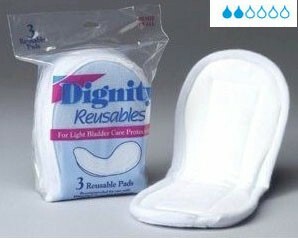 Contoured for the utmost in comfort, the soft dry fabric of the Dignity Reusable Incontinent Pads feels clean and fresh against your skin. The uniquely designed channel helps distribute fluid throughout the pad. The absorbent core is made from a poly/rayon blend and the barrier is made from a poly/vinyl knit. 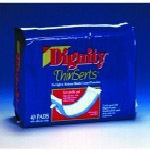 Use the Dignity Reusable Pads with both, protective underwear or regular underwear. Machine wash and tumble dry warm cycle. Pads measure 4 1/2" X 10 1/2"
Three pads per package. Used for light urinary incontinence protection. 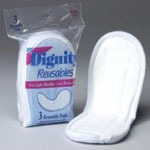 Use these soft, super absorbent liners with incontinence protection underwear or with your own regular underwear. 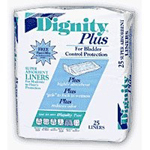 Dignity Thinserts with an adhesive strip, for light to moderate bladder control problems. Use with your own underwear or add on to incontinence padded underwear. Moderate to Heavy Bladder Control Protection! Extra Absorbent Bladder Control Pads provide confidence and reassurance that light to moderate incontinent accidents will remain hidden.